The first thing that crosses our mind when we see a person with toned abs is that he must have been running endlessly and spending hours in the gym doing crunches to get that perfect flat stomach. Maybe he has, but you should know that crunches and running aren’t the best way to get flat abs and burn all that fat around the waist. You can do a number of other exercises and adopt a specially designed routine which engages all the core muscles, burns fat and tones the abs much more efficiently. We’ve selected 4 exercises for you which will give you the perfect six pack much faster than crunches. The following exercise is quite unique when it comes to ab-toning exercises because it has a twisting moment and impacts the obliques not just the abdominal area. If you’re sick and tired of your “love handles” this exercise is designed just for you. It will strengthen and tone the sides and your stomach at the same time. Get on the ground and lie on your back positioning your feet flat on the ground, with knees bent upwards. Lift your upper body to a 45 degree angle and twist it to your left. Go back to the starting position and then twist it to the right. You can feel how the exercise is attacking your side muscles as you twist to one side and then to the other. This is one repetition. For bigger impact you can try lifting your legs off the ground while doing the exercise. As you progress and feel like the exercise is getting too easy you can take a dumbbell or another heavy object on your hands while you do the exercise. Yoga is the best exercise for toning and burning fat and the scale pose is the perfect pose for core resistance training. This pose is an isometric exercise, which means that your muscles aren’t contracting you’re just holding them in the given position. 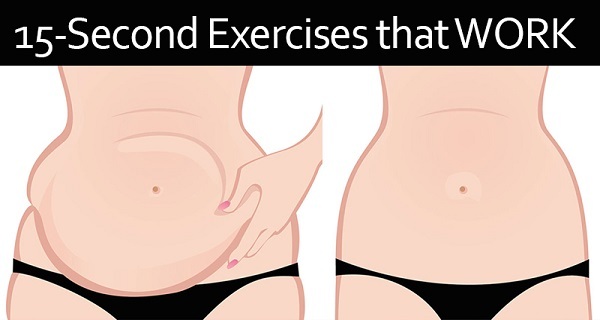 According to some studies this type of exercise can be connected to lower fat levels, which means that it’s perfect for belly fat burning. Sit down on the floor and cross your legs while placing the palms beside your hips face down. Exhale and push your hands against the floor, flexing the abs and trying to lift your body up from the floor. In the beginning it could be difficult to lift your entire body up, but it’s ok. Try to push as hard as you can until you feel high resistance and hold in than position. Try to stay in that high-resistance pose for at least 10-15 seconds. Here we have another yoga pose which again is perfect for burning fat and getting a flat and toned stomach. Sit down on the ground and extend your legs straight in front of you. If you want you can grab your big toes or hold onto your calves to stabilize your body while you do the exercise. Lean, or use momentum to “rock” your body backwards while you’re flexing your core muscles simultaneously until you reach a V shape, like the picture above. Hold in that position for 10-15 seconds. Once you master the pose and you feel like you need a bigger challenge let go of your legs or toes and hold into the position just using the core muscles. This is really hard so if you’re just starting the routine don’t even try it. Wait until you get more experienced. This exercise is extremely effective but it’s greatly underrated because it targets the posterior chain. This is a group of muscles located at the back of your body and strengthening and toning these muscles is crucial when it comes to preventing injury or increasing your core strength. By toning and strengthening these muscles you’re making it easier and safer for yourself to perform all the core exercises which target the abs. Maybe you didn’t know but almost all of the core exercises involve using your posterior chain muscles heavily and if they’re not up to the task you can end up injured and the exercise will be much more challenging. Lie down on the stomach, stretch your arms in front of you while stretching your legs behind you. Then lift your upper body off the ground as much as you can. Hold in this position for 10 -15 seconds. If you want a bigger challenge, try to lift your legs at the same time, keeping them straight while holding in that position. We’ve listed the 4 most effective exercises but now you need to know how to introduce them into your workout routine properly, for maximum results. You should start with the abdominal twists. Divide them into 3 sets and start with 5 reps in the first set. Continue with 8-10 reps in the second and third set. It could be a challenge to increase the reps in the 2nd and 3rd set but if you feel like they’re too easy or too difficult you can increase or decrease the number of repetitions, it’s up to you. Just don’t push yourself too hard you could end up with an injury. For the last set do as much as you can. Take a 30-40 second break between the sets. The scale pose, the swan dive and the V pose are isometric exercises, which means you won’t be doing any repetitions just holding the position for 10-15 seconds, or more if you feel you can. After each exercise take a break which is 10 seconds longer than the amount of time you held the position for. If your exercise was 10 seconds, take a 20 seconds break. Do this after each exercise. Next post: Have This For Breakfast Every Morning and Watch How The Fat From Your Body Disappears! Previous post: 20 Reasons You Should Eat 3 Bananas Daily – And No They Won’t Make You Fat!